Here is your Angel Card Reading & Channeled Message for the week of 2/26. 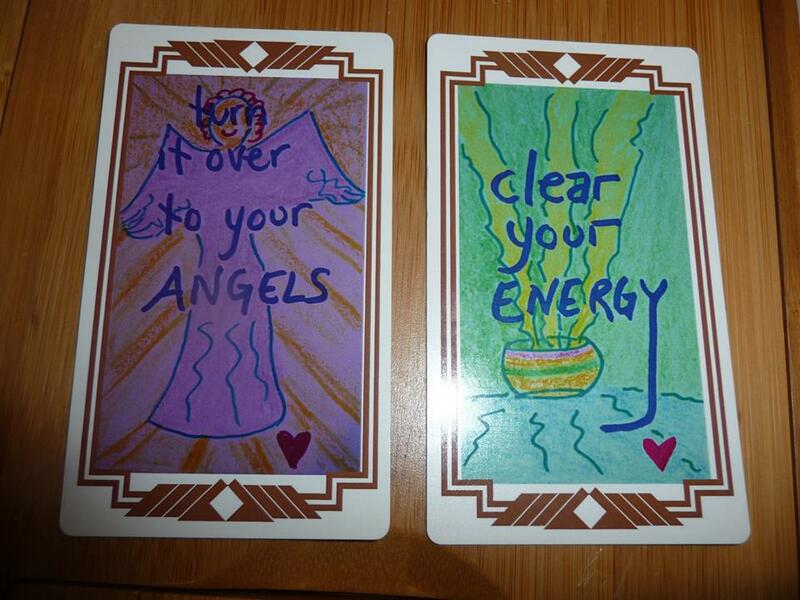 For this week’s reading, the angels took me right to the Energy Wisdom Oracle Cards by Dina Kennedy (yes, me! ), 2 card pull. The first card this week is one of my favorite cards and favorite reminders. The card is TURN IT OVER TO YOUR ANGELS. With this card the angels are asking that you very deliberately turn over whatever is challenging you, whatever you are worrying on, obsessing over, afraid of, having trouble seeing your way through, to the angels. I do this quite literally. I turn it over, and then I trust that the angels, who see things in a way I never can, will either resolve the issue, or provide me with some kind of nudge, bit of info, sign, conversation, whatever it takes, to begin moving me along to a path of positive resolution. What I love about the turning it over process is that when I do this, everyone involved wins. It’s just so darned angel-y! Learning to do this with my problems, worries, and stressors has made life so much easier for me. It helps me get untangled, be grounded and in my Light, and find my flow in whatever it is I turn over. And I feel supported. Plus the way the resolve things is just mind blowing – they come up with solutions I would never find. It’s pure magic. And with this card they are saying that they’d like to do this for you as well. The second card today is a repeat of last week’s, so clearly we, as a collective group, have some serious work to focus on with this! The card is, once again, CLEAR YOUR ENERGY. When this card comes up, the angels are letting us know that we are not running clean and clear energy. We are tangled in something, attached to something, not getting clear, not letting go, and probably not releasing energy cords and hooks between us and others. Start with some grounding work today, please, and set your intention to and then let old energy flow out of your body, through your feet, and into the earth who will transmute it. If you can, do get outside for this. Since this card is here for all of us again this week, I’m going to focus on clearing our energy in the blog all week, with tips, tool, and musings to raise your awareness of the importance of daily clearing. Until then, we are complete. You are so loved. p.s. If you are doing the “drop one ball” challenge discussed here: http://www.dinakennedy.com/2-23-drop-one-ball-on-purpose/ don’t forget to drop that ball again today! If you are doing the 21 Day Self Reiki or Meditation Challenge we’re doing here: Dishing With Dina today is Day 3 (feel free to start today if you’re just becoming aware of this! ).